The Invasion Day marches on January 26 brought many tens of thousands of people on to the streets around Australia. Whether marked by First Nations and their allies as a Day of Mourning, of Survival, of Invasion or all three, January 26 has immense significance. In Alice Springs on Arrernte Country, shadows were cast by the recent suicide of two young people. Almost 12 years earlier the army, like its British parent, invaded the First Nations of the Northern Territory “to save the children” but grabbed their land instead for fracking, mining and tourist corporations. In “Australia Day” honours, the parents of a young girl who suicided were acclaimed for their powerful campaign to keep young people safe. Yet where is the recognition for those First Nations’ families and communities who’ve fought for the justice and hope for the future that their young people need? Where is the media’s huge outpouring of grief for the inconceivable imperialist brutality that creates an epidemic of suicide among Aboriginal children and youth across this continent? 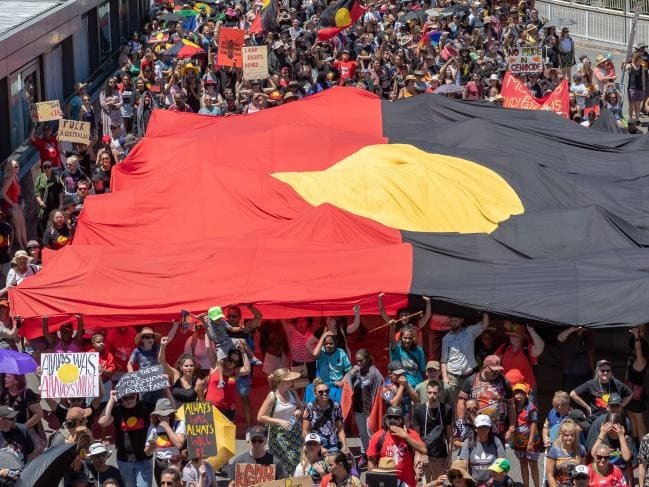 In Sydney, where 35,000 marched, Leetona Dungay spoke of her son, denied the right to breathe, suffocated by the overpowering force of the state’s gaolers at Long Bay as he begged for his life. Where are her honours for demanding justice for her son, after two Royal Commissions’ recommendations continue to be ignored? There is more than the litany of horrors of ongoing invasion. There is resistance and revival. There is a deafening call to all of us to decolonise our minds and our actions, to educate friends and family and workmates. Sovereignty has never been ceded. The Law and Culture of the land, with language and songlines and ceremony their heart, predates invasion by tens of thousands of years. All this was suppressed, but survives and strengthens. “Australia Day” events get wall to wall coverage, but are forced to acknowledge that this was no empty land, that civilised nations with rich cultures existed here for 60,000 years. Troy Casser Daley’s ‘Shadows on the Hill’ is voted Tamworth Festival’s Heritage Song of the Year. It tells of the massacre of his Gumbaynggirr People. On stage he speaks of learning this truth from the Old Men. Attempts to co-opt First Nations will fail because they too are decolonising their minds. Some are simply walking on to their lands and taking them. Protests are organised by emerging Aboriginal leaders and Elders in country towns against ongoing theft of children, murders and corruption. People speak of Treaties and what they mean. Many say they cannot have Treaty with governments under this imperialist system of ongoing invasion. The boot may be on their necks, but for 231 years they have refused to give up.